Located on the western edge of Texas, right on the intersection of routes 90 and 67, Marfa is as unlikely a town as any to be such an important centre for modern American art and culture. Founded in the 1880s as a railroad water-stop, it still feels a little like it’s on the way to somewhere else. In the 1970s, Donald Judd fell in love with the area, the flat horizon and scrubbed rawness of the high plains landscape no doubt fuelling his bent for minimalism, and artists have been coming here ever since. There is more than a hint of this adventurous experimentation in the newly minted Hotel Saint George. 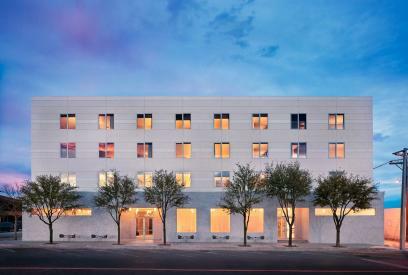 The Houston-based architect Carlos Jimenez Studio has built a pleasingly rectangular, four-storey block in Marfa’s south-east corner, right on top of the footprint of an 1880s hotel of the same name. Its angular severity would have satisfied Judd, as would the industrial-chic interiors of polished concrete floors, mahogany and white steel trimmings. The 55 rooms are dressed by Alice Cottrell in Austrian sheepskin rugs and distressed leather couches – all the better to take in the Wild West panorama of Chinati Peak and plateaus. But it’s the public spaces that command the attention. The Marfa Book Company has set up home in the lobby that’s part book-store, part performance space and part concept store – a perfect partner to the outdoor pool, a fine dining restaurant, taco stand, art by Mark Flood and Jeff Elrod and, of all things, a farmer’s market.